Every month Doug Short at Advisor Perspective writes an excellent report on GDP. 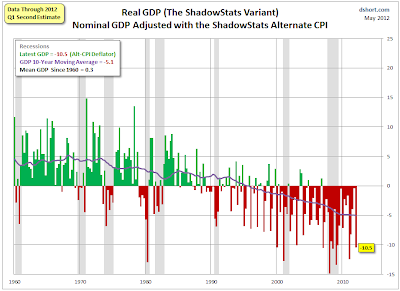 With today's release of the Q1 GDP Second Estimate, Doug Short has a new column worth a good look: Will the "Real" GDP Please Stand Up? (The Deflator Makes Big a Difference). How do you get from Nominal GDP to Real GDP? You subtract inflation. 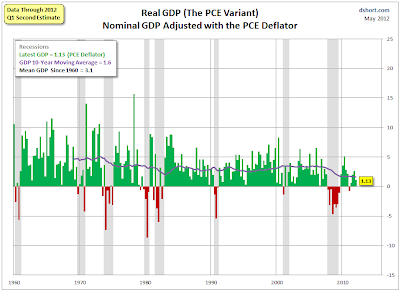 The Bureau of Economic Analysis (BEA) uses its own GDP deflator for this purpose, which is somewhat different from the BEA's deflator for Personal Consumption Expenditures and quite a bit different from the better-known Bureau of Labor Statistics' inflation gauge, the Consumer Price Index. I have a note at the bottom showing the real GDP calculation method. 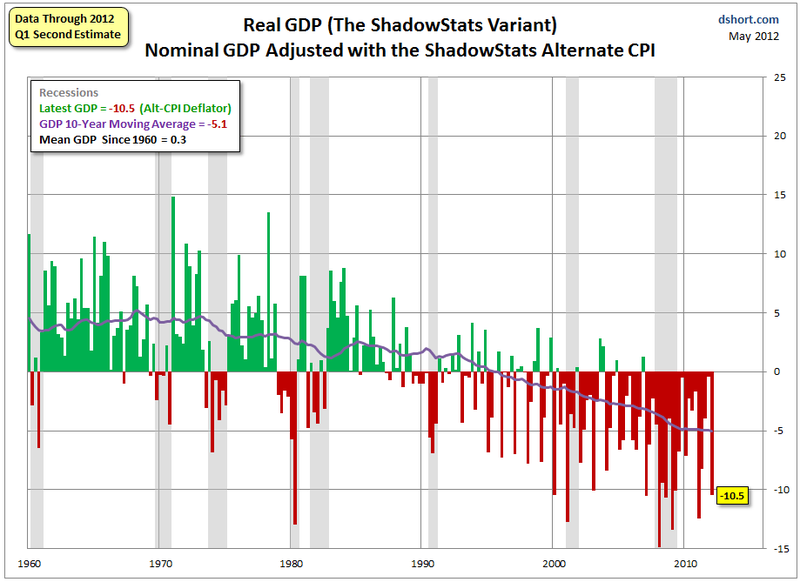 Suffice to say that the higher the increase in compounded annual percentage change in the deflator, the lower the real GDP. Conversely the lower the increase (or if there is a decrease), the higher the real GDP. Doug Short calculates the GDP using four different deflators. The first three charts are all similar looking but charts 2 or 3 seems more reasonable than the official numbers. Here are two of the charts. I find this "alternate Real" GDP to be interesting (in a bizarre sort of way), but I personally see no credibility in the hyper-negative GDP it produces. On the contrary, I see this chart as further evidence that the alternate CPI, despite its popular among many critics of government data, is a misguided concept. Bizarre is a polite way of putting things. I would call it total nonsense. For Williams to be correct one would have to believe the economy was in a recession the vast majority of the time for the last 25 years. Williams has a huge following, mainly by the hyperinflationist crowd. Williams himself has been predicting hyperinflation for some time. All of the hyperinflation calls have been missed by a mile. The dollar is strengthening, consumer credit is once again sinking, and treasury yields just made 60-year lows. Williams makes all of those mistakes, being far too US-centric in his analysis, and compounds the errors by methodology that produces the absurd results shown above and also by confusing unfunded liabilities with debt. Note that according to the latest HOUSEHOLD DEBT AND CREDIT report by the Fed, consumer credit other than student debt is contracting. Also note that $1.06 trillion of consumer debt is currently delinquent, with $796 billion seriously delinquent. Think that will be paid back? I don't. And Hyperinflationists fail to understand the ramifications. I happen to agree that the US has a day-of-reckoning coming, but the entire fiat global financial system fueled by insane levels of fractional reserve lending will come crashing down at the same time. That is precisely why this deflationist (unlike others) happens to like gold as a safe haven.